During our day trip to Tybee Island, we at "Sting Rays" for lunch. My husband had the fish tacos and I enjoyed the fish sandwich. The tacos were served with a wonderful spicy chipotle sauce and we both fell in love. I think we ate it with everything...Fries, sandwich, tacos...yum! After browsing some recipes, I decided to try replicating the restaurants sauce. I think I came pretty close. This sauce is spicy, tangy, sweet and just awesome. In a food processor, combine chipotle peppers, yogurt, mayo, hot sauce, cumin, chili pepper, and 2 tablespoons lime juice. Puree, scrape sides and puree until smooth. Add remaining 2 tablespoons of lime juice if sauce is still thick. 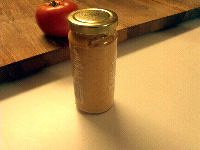 Save in a jar and refrigerate until ready to use. Great on fried or grilled fish tacos.